Halloween was definitely a Mack-holiday. 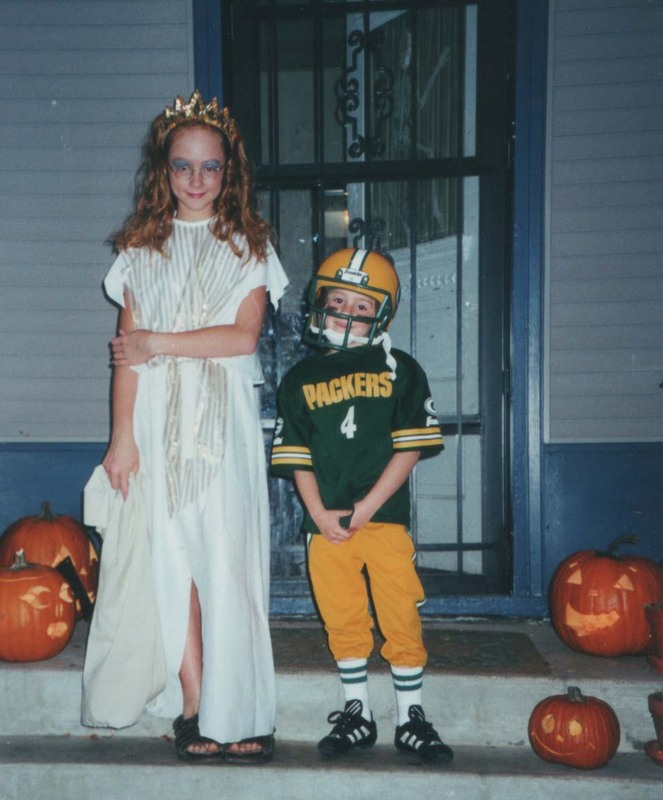 Costumes and candy are a winning combination for every kid, but Mack set the quintessential example of how best to celebrate and to seize the day with the most kid gusto. She believed that the collection of a giant bucket of candy and the permission to gorge yourself into a sugar coma was simply the best idea ever in the history of the world. 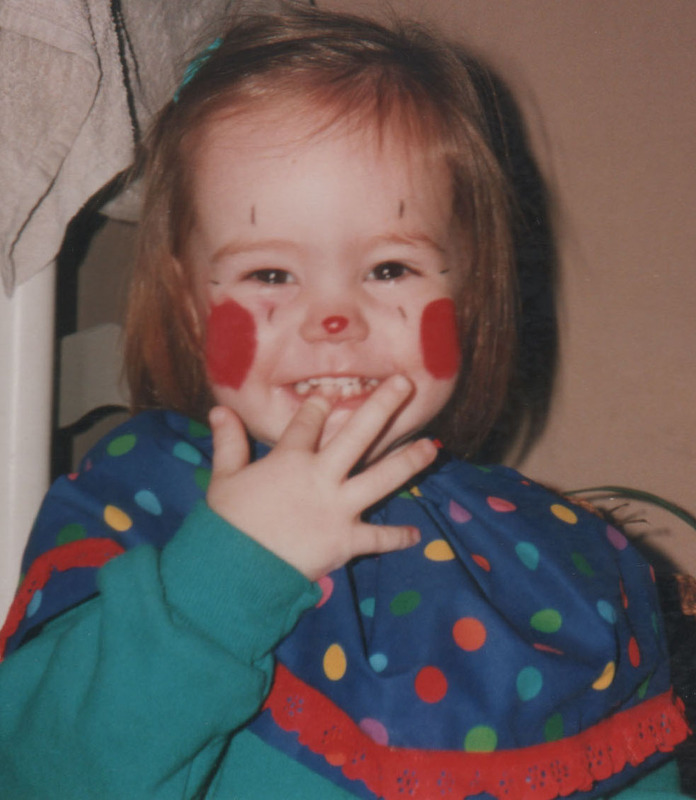 She saw selecting the perfect costume and then putting your whole kid heart and soul into it as a moral imperative of childhood. 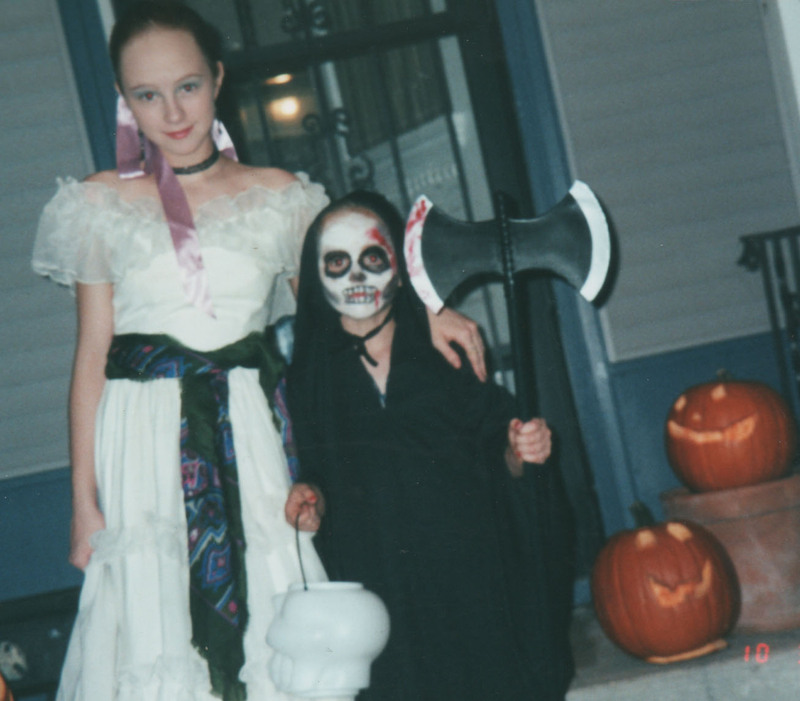 And trick-or-treating through heavy fall leaves in our historic Washington Park neighborhood—where most of the houses were spooked out with deadly decorations, creepy lights, and haunted music—was her favorite night of the year. I miss Halloween with kids, and last week I purchased a giant $15 bag of candy even though I will not host a single trick-or-treater. Those Halloween sweets sitting in a big bowl in the kitchen all week have reminded me of the Halloween memories I have of Mack. While Kevin, Savannah, and I enjoyed Halloween before Mack joined our family, Mack’s enthusiasm for the holiday inspired us all to make it family favorite. Over the years, the four of us celebrated Halloween with themed baked goods, truckloads of candy for trick-or-treaters, decorations (including an expensive porcelain haunted mansion), and regular costume parties. 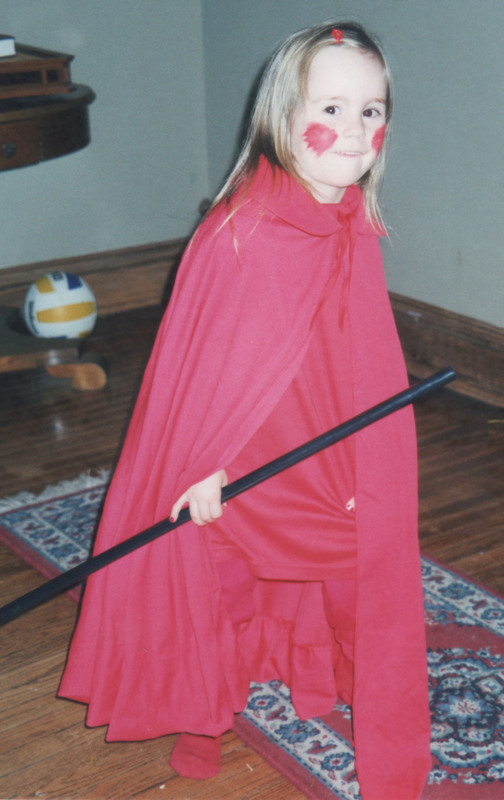 So on this Halloween day, 2015, I want to celebrate Mack’s love of Halloween, to pay homage to her exuberance for costumes and for candy, and to illustrate her wholehearted embrace of America’s best kid holiday. As per usual, photos speak more loudly than words where Mack is concerned, and the following images exemplify Mack’s enthusiasm for Halloween, illustrate her sense of humor, and reveal something of the evolution (or, perhaps, de-evolution?) of her chosen costumes. 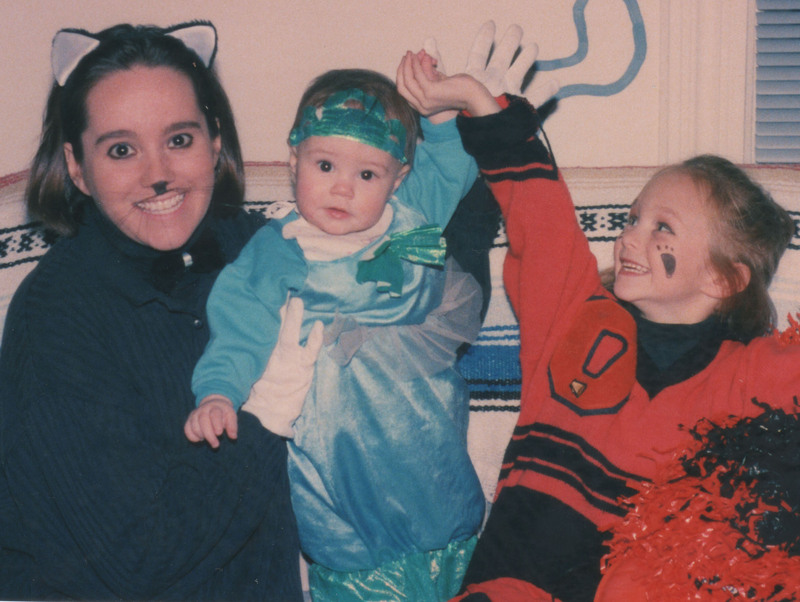 Mack would never have chosen a mermaid costume herself, but baby Macko had no choice. 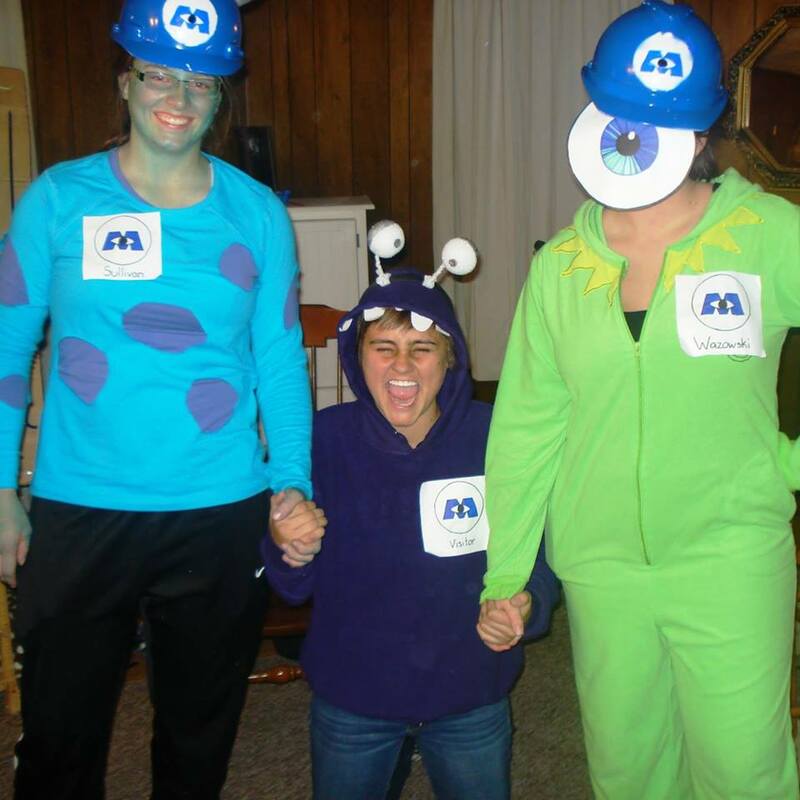 Mack was always horrified that I had dressed her in such a way, but I have no regrets; because I absolutely adore this Halloween photo of me and my girls! 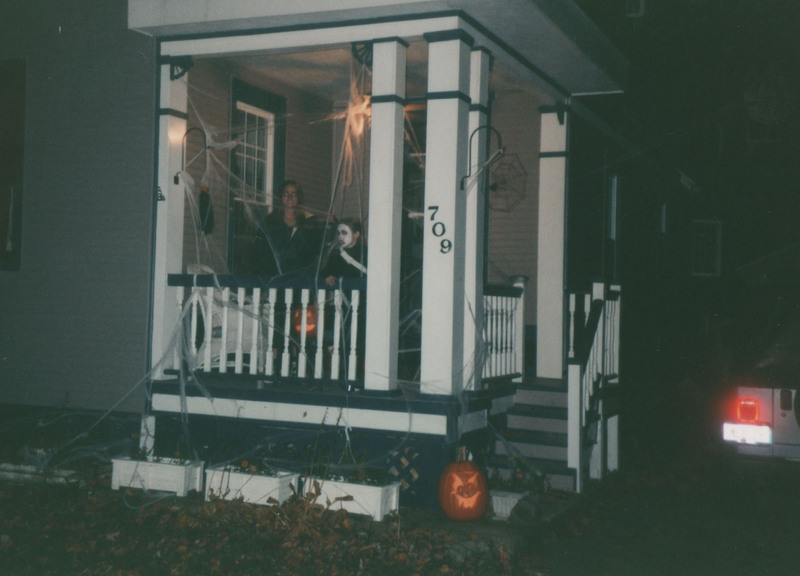 Our old neighborhood was full of young families, and Halloween was a serious event…porches were transformed, lawns became graveyards, and there was one house where Count Dracula invited kids up to a scary porch through mist, spooky sounds, and haunting music. Trick-or-treating in our neighborhood was magical for my girls, and Mack always insisted we do some porch decorations. We were not the best house in the neighborhood by a long shot, but at the very least, we always had jack-o-lanterns and a mechanical bat that flew around the porch. 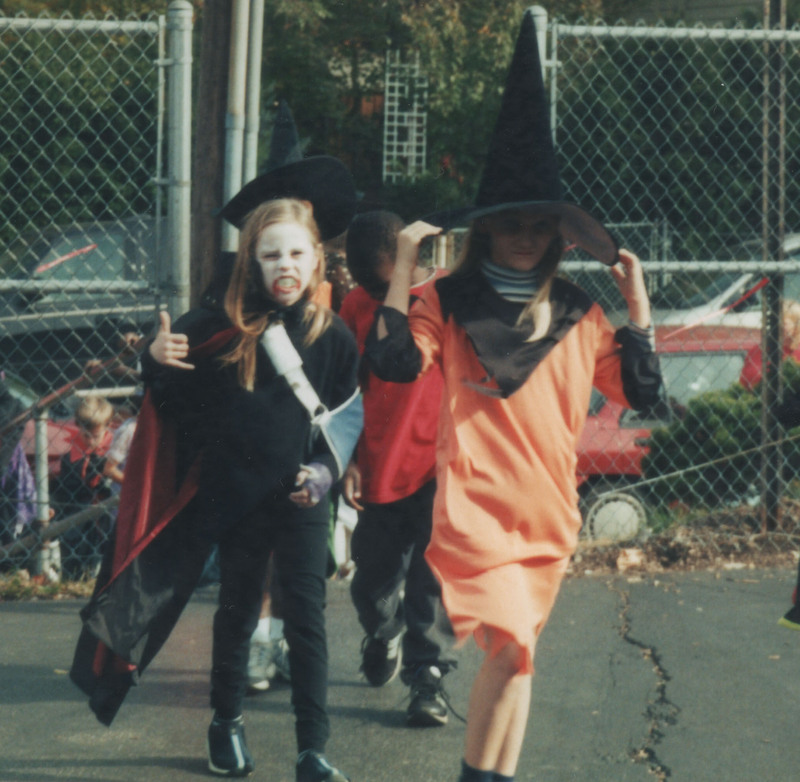 Halloween costumes were almost always an easy way to tell my girls apart and to perfectly illustrate the differences in their personalities, as well. 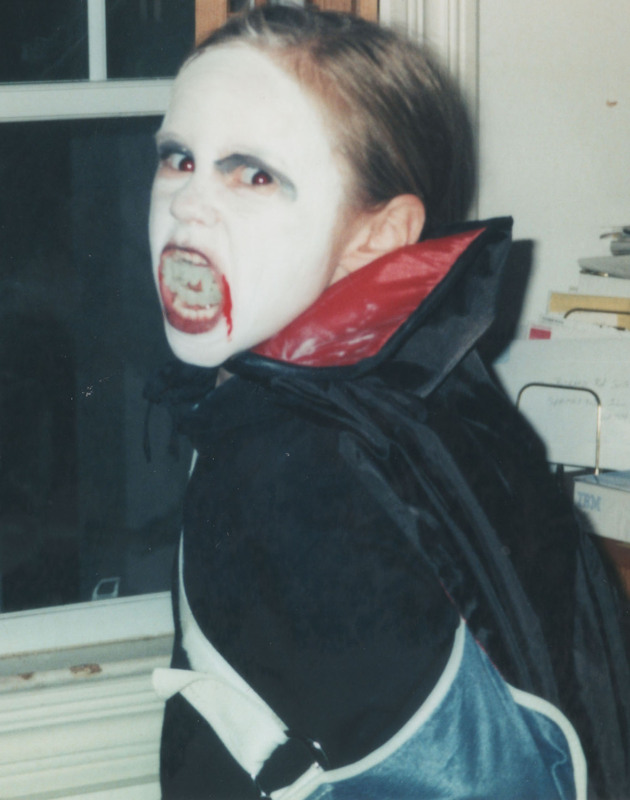 One year, Mack did not let a badly broken arm stand in the way of her and Halloween; and even dressed as a vampire, she was still the cool kid on the block (Word!). 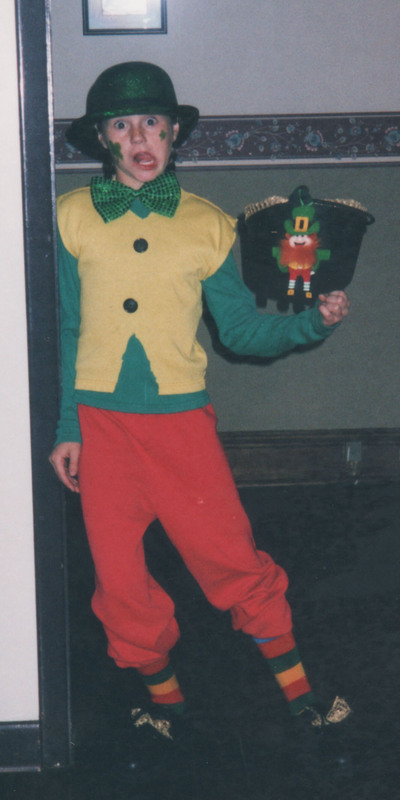 One year, Mack was a leprechaun, and it is my all-time favorite Mack-holiday costume. 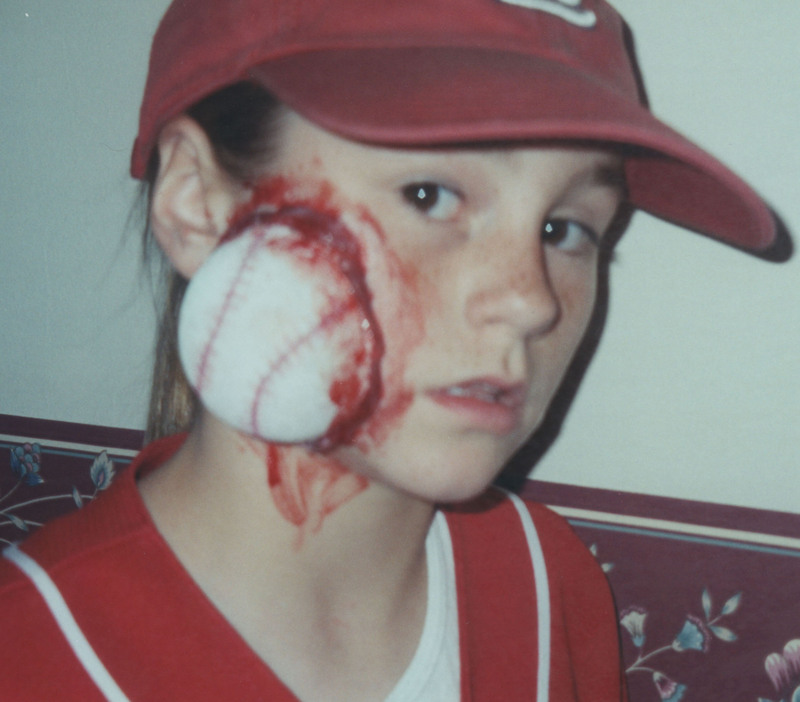 She was a leprechaun every day of her life, so playing one on Halloween was likely her most comfortable Halloween role. 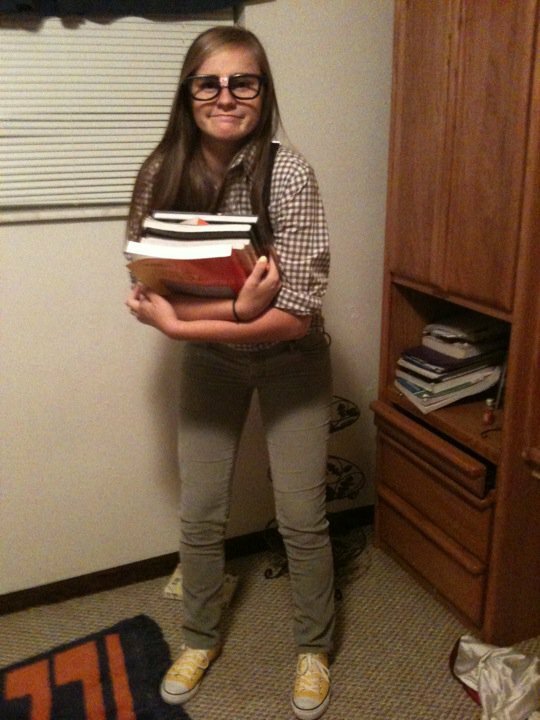 (A previous blog explains this perfect costume: https://macksmommabear.com/2015/03/17/mack-day/). I’m not sure how Mack came up with this one, but with her Dad’s movie makeup skills, she certainly looked just as awful as she had hoped. Mack trick-or-treated in our neighborhood her freshman year of high school against my protestations that she was too old. She argued quite emphatically that it was cruel to deny her one final participation in her favorite childhood pleasure. When she returned home that night, I watched her dump out the fully loaded pillowcase with the wild eyes of a ten-year-old, and I was glad she had convinced me to allow my high school girl to hang on a little longer to her childhood. Mack loved to sing. She sang in the shower in the mornings before school. She sang in her bedroom while dancing on the bed. She sang to music blasting into her ears through her headphones in the backseat on car trips, oblivious to the existence of fellow travelers. She sang on the school bus on her way to out-of-town sporting events, leading her teammates in song and distracting them from the homework they should have been doing instead. But when Mack got her driver’s license, her old Jeep Wrangler became her favorite stage. She would roll down the windows, crank up the tunes, and sing with enough volume to overcome both the music and the Jeep’s rumbly engine. Mack was happy to serenade anyone within earshot. Carefree and unbothered about how people in the surrounding cars might judge her singing voice or her song choices, she would belt out her favorite tunes in Mack-crazy style. I loved to listen to Mack sing. 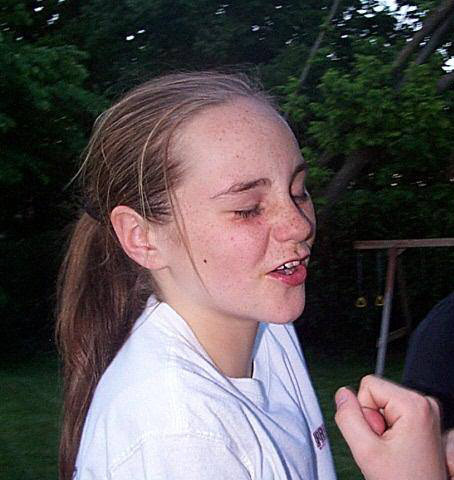 I loved how she would hum a pop tune while brushing her teeth or rap to Eminem in the grocery store. I loved pressing my ear against her bedroom door to listen to her sing and strum one of her guitars. 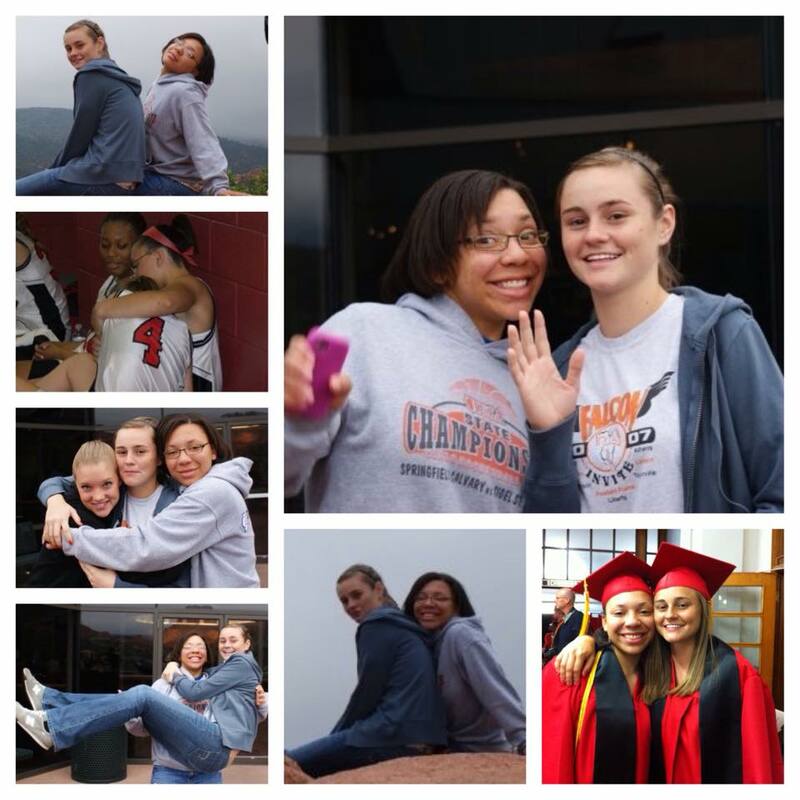 I loved her singing with friends in the backseat of the car when I chauffeured them to the movies or to summer basketball tournaments. It was always a hoot to listen to them giggle and sing to twangy country songs like “Tequila Makes Her Clothes Fall Off” or croon like divas to Beyonce’s “Irreplaceable.” I loved it when Mack’s exuberant voice filled our loft with Broadway show tunes on weekend trips home from college. When Mack sang, I was always entertained and amused, but singing with Mack was one of my favorite pastimes with her. She had a magical ability to pull people along for a warble; and when you sang along with that kid, she carried you with her to her Mack-happy plane of existence. Over the years, Mack and I did a lot of singing together. When were alone in the car, I shared my favorites from the 1980s, and she got me hooked on Taylor Swift and Kanye West. We would sing so loudly that we couldn’t even hear the music. In the kitchen while chopping vegetables or doing dishes at the sink, we would sing Disney songs (“A Whole New World” was one of our favorites), and every crescendo featured Mack dancing with veggies or the dishes. We sang our own stupid original songs, we sang to our pets, and our birthday serenades were the stuff of family legend. After losing Mack, I stopped singing. During work commutes from St. Louis to Springfield, I kept the dial on NPR, not at all tempted to blast my special ‘80s mix created especially for those weekly trips. Even during two long, solo driving trips to North Carolina and Nebraska this summer, I did not pass the time with music or singing. Grief has a way of stifling your enthusiasm for the things that used to make you happy, and singing in the car was one of those things I just stopped doing. But last week, on the way home from Springfield, when I was about fifteen miles from home, I changed the dial from St. Louis Public Radio to KSHE 95. The NPR story did not have my attention, and without thinking about it I hit one of the programmed buttons on the car stereo. Just as soon as the station changed, the familiar piano introduction to Journey’s “Don’t Stop Believin’” sucked me in, and before I knew it I was tapping my foot and preparing for the introductory lyrics. I turned up the volume, and I sang the entire song at the top of my lungs…just like Mack and I always did. After the song was over, I remembered how much I loved to sing in the car. I remembered how much Mack loved to sing in the car. And I remembered that Mack had written a music blog for her college radio station that offered her top ten list of songs to sing at the top of your lungs. It is a very good list, complete with several of the favorites that she and I shared as well as a couple of more obscure Mack-like selections. 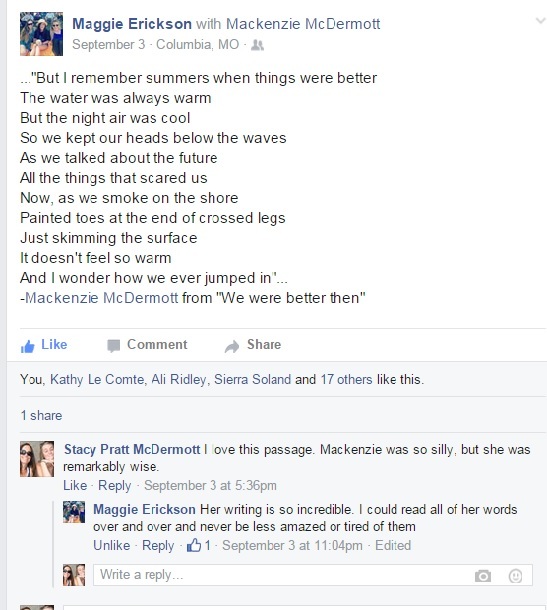 Singing with Mack was a joy to me, and singing with Mack is also a cherished memory for many of her friends. Therefore, I offer up that top-ten list, complete with internet links below, so that anyone who wishes it can sing along with Mack in spirit. And since I can now sing in the car again, I will keep all of Mack’s favorites at the ready, sing them at the top of my lungs, and let Mack transport me over and over again to her Mack-happy plane of existence. There is great music with amazing lyrics, music with really awesome beats, and super artsy and unique music. What kind you enjoy is completely a matter of taste. However, there is a certain type of song that magically creates an insatiable need to roll down the windows of your car and scream every lyric, even if you only know the chorus. It might not always be the best music—sometimes it’s even pretty bad—but this is the music that unites us all. “No Scrubs”—TLC. This song is like listening to the ‘90s, and not singing along to its impossibly awesome chorus should be against every law. Roll down the windows and let it all out, because you don’t want no scrub. (https://www.youtube.com/watch?v=FrLequ6dUdM). A Family Birthday Serenade recorded for Savannah (https://youtu.be/dy2_eVr_JrM). 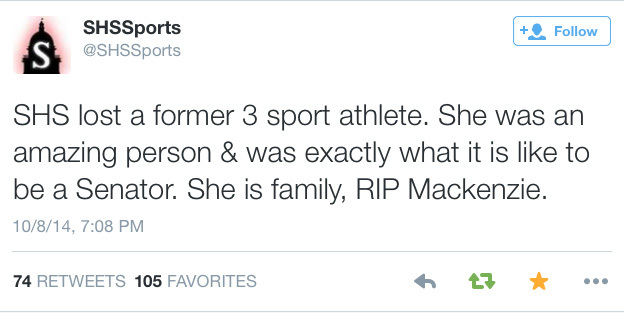 Ok people, now go sing at the top of your lungs…It is exactly what Mack would want you to do. One year ago today, we lost our incomparable Mack. For all of us who loved her, the sky is cloudier, the sun is less bright, and the world is far too quiet. With tears we have paved the winding road of this grueling, twelve-month journey without her. Along the path, we have tripped over anger, stumbled on sorrow, and struggled for air to breathe. Yet between stretches of hard travel through grief, we have taken respite from it by finding ways to keep Mack with us. Some great deeds as well as simple gestures have offered us rest for our weary and broken hearts, have given us strength to make it around each uncertain bend in the road, paid tribute to Mack’s beautiful spirit, and honored Mack’s significance in our lives. During my journey of grief over these last 365 days, I have been buoyed by the abiding love of family, by the patience and kindness of friends, and by the constructive therapy of writing. 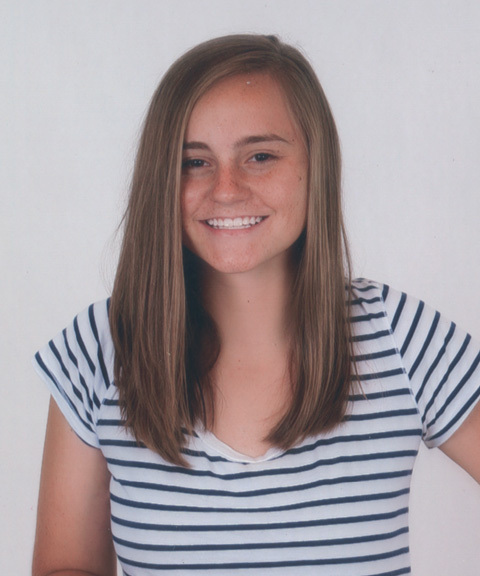 I found solace in the beautiful and fitting memorial service for Mack, I drew strength from heartfelt tributes from her family members and friends, and I continue to take comfort in the photos and stories about Mack posted on social media. 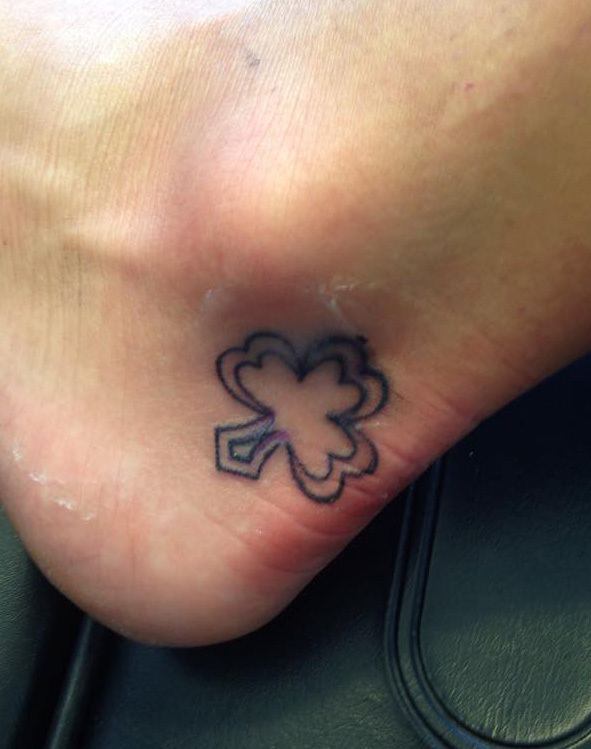 The tattoo on my wrist honors Mack’s name and will endure until my own death, an endowed scholarship will give meaning to Mack’s life in perpetuity, and an elegant brass plaque on granite in a peaceful spot near the Lincoln Tomb will mark the place where Mack will rest easy for all eternity. 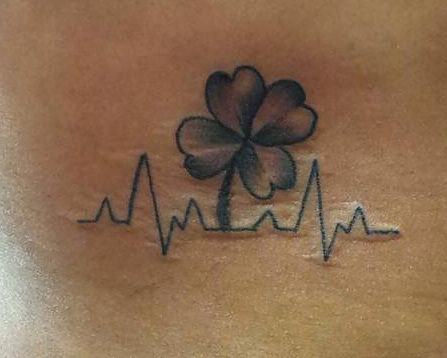 These great deeds and simple gestures have not lessened the reality of my terrible loss, but they have eased my journey. They have not kept all of the bitter tears and deep sorrow at bay, but they have provided me the strength I need to survive my terrible loss. Most importantly, they have shown me that despite Mack’s short time in the world, she made an inspirational and everlasting impression on the lives of the people who loved her. 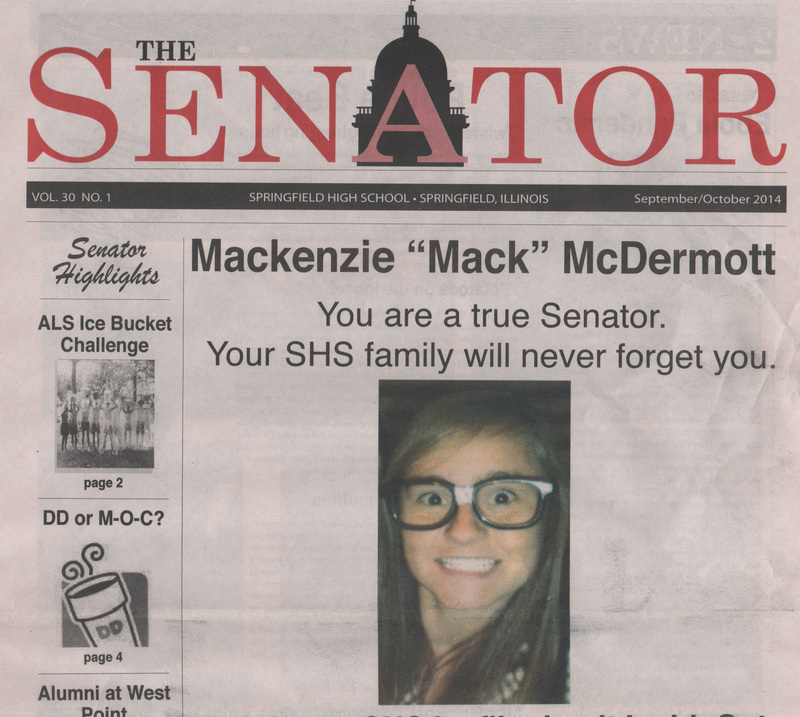 Nearly 600 people gathered in the gymnasium at Springfield High School on Sunday, October 12, for our public goodbye to Mack. It was a dreadful day for all of us, but it was also a respite from our private sorrow. 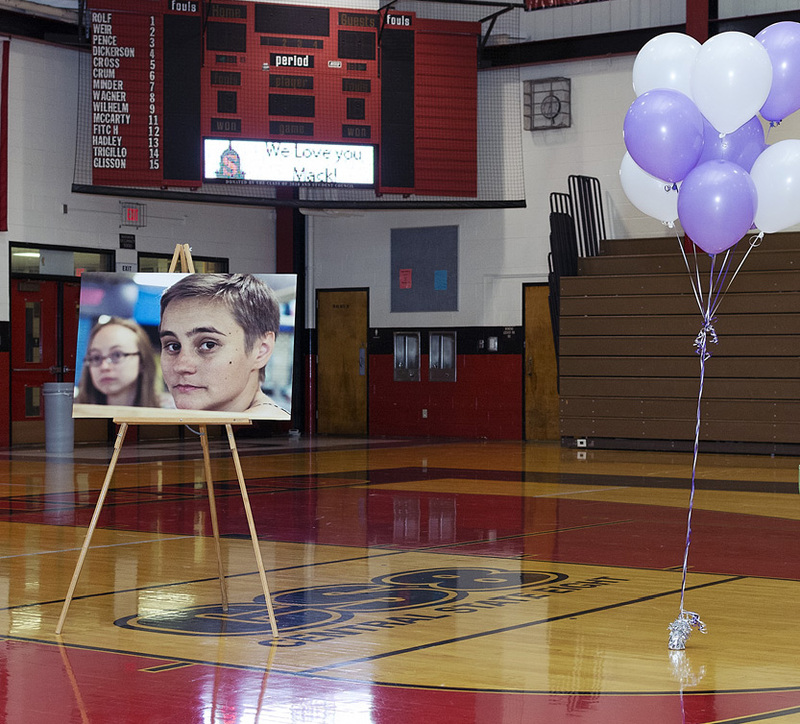 The purple balloons, the giant picture boards, Mack’s high school softball teammates presenting her jersey, and eulogies by her second father, her favorite teacher, and her best friends broke our hearts but also lifted our spirits. There was great comfort in being there with so many other people who loved Mack. The dear friends who made this beautiful memorial service possible gave us all an amazing gift: the public time we needed to cry together, to acknowledge our terrible loss together, and to celebrate Mack’s life together. Social media has offered all of us a forum to share our personal stories about Mack, to post our favorite pictures with her, and to draw strength from knowing we were not alone in our grief. 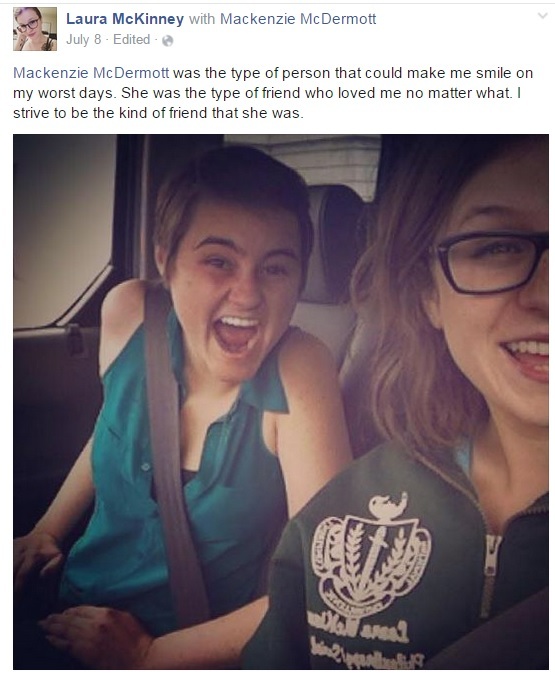 In the first terrible weeks without Mack, there were hundreds of tributes on Facebook and Twitter, and there was a deluge of photos, short notes, and longer homages. The daily posts have now ceased, but there is still a regular hum of activity on Mack’s page, as people add reminiscences, express loneliness caused by Mack’s absence from their lives, and, even sometimes, continue to talk to her. Say what you will of the vagaries of Facebook, but for me it is a positive presence, a helpful friend, and a portal to Mack’s beautiful collection of people. 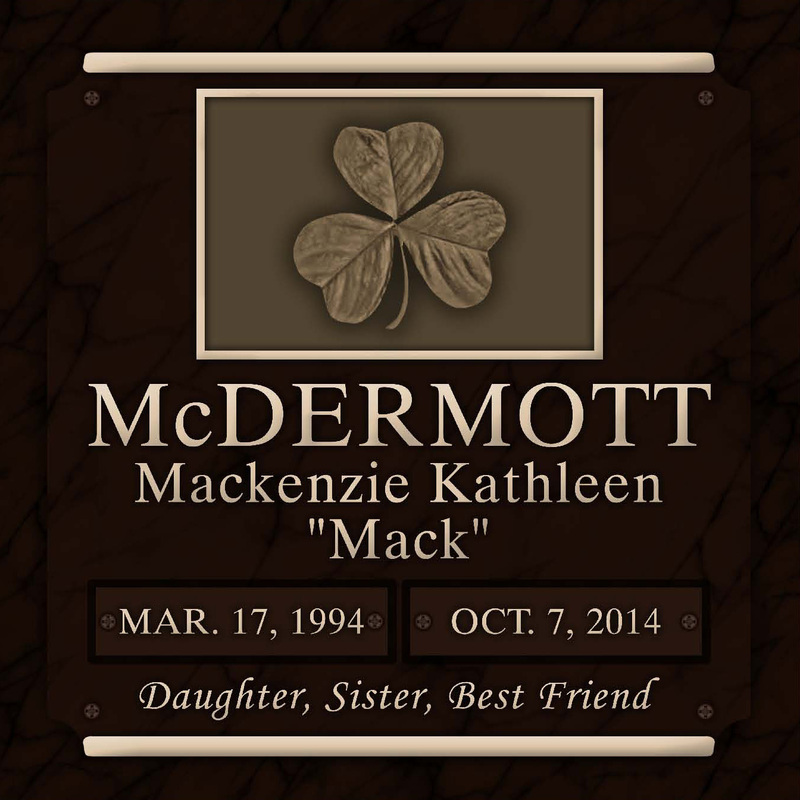 Just hours after losing Mack, I was compelled to write about my loss. This memorial blog has given voice to the emotions that threatened to drown me. Writing shined a light on the path of my journey through the dark days, and I have been lucky and thankful to find some grace along the way. The blog captures my sorrow, but it also seeks to capture my girl; and in capturing my girl, it has led me to smiles and laughter I desperately need. The writing helps me and, it turns out, the writing helps others (especially Mack’s grandparents); and this is a most wonderful and unexpected gift that I am happy to bestow upon the people who feel Mack’s absence as keenly as I do. Writing is a powerful remedy for grief, and I am grateful that others have picked up their pens to honor our incomparable Mack. Kevin edited a beautiful volume of Mack’s writing and has given us all a sweet and personal keepsake. But this fall, Truman State University will accession a copy of Mack: Her Life and Words (http://mackmcd.yolasite.com/) into the collections of the Pickler Memorial Library, which will preserve Mack’s words at the campus she loved. And as the following elegantly penned eulogies attest, writing can, indeed, set us free. Sometimes, it is a simple gesture that warms our hearts and keeps Mack close. 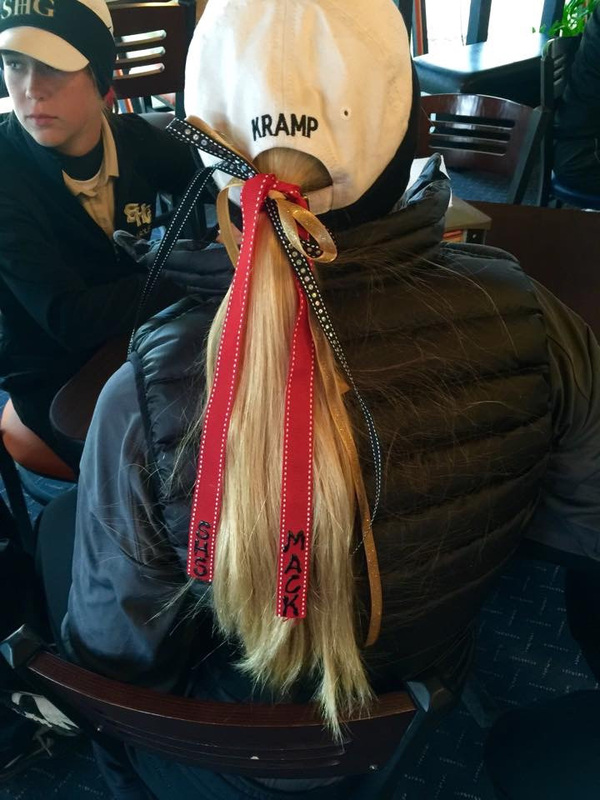 In November, just weeks after Mack’s death, some of her golfing buddies (who played for a rival high school) wore Mack ribbons in Mack’s high school colors during their appearance in the state tournament. 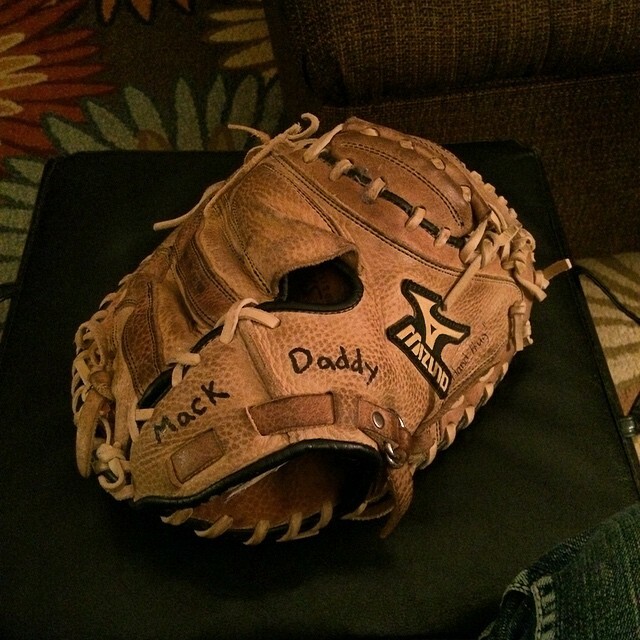 A favorite Mack mom made memorial t-shirts, and a younger softball teammate wrote her nickname for Mack on the catcher’s mitt that Mack had bequeathed to her. 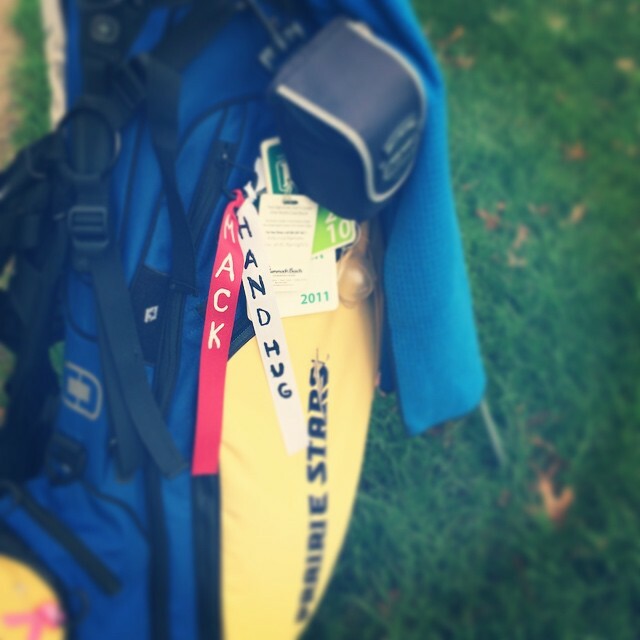 A lifelong friend and golf teammate adorned her golf bag with ribbons honoring Mack, and I and at least two other people who loved Mack, got tattoos to commemorate the imprint Mack made upon our hearts. (https://macksmommabear.com/2015/04/22/permanent-mack/). Mack was cremated in Spain, but even upon the return of her remains to the United States, we made no plans for interment. As some time passed, however, and some of the shock wore off, we decided that interment and a permanent marker were important to us. Oak Ridge Cemetery, the beautiful and tranquil home of the Lincoln Tomb, was our immediate and contented choice. Springfield is Mack’s hometown, and the historical significance of Oak Ridge strikes a peaceful chord in my historical sensibilities. We have chosen a grassy spot under a gigantic and gnarled old tree that keeps watch over a quiet grassy area with old and new headstones. A marker in bronze with a lovely shamrock will note Mack’s existence in the world, all of us who need it will have a physical place to commune with Mack’s spirit, and the historian in me is grateful that Mack will belong to the ages near Mr. Lincoln. Most of my attempts to survive this unbearable loss have been small gestures that bring me welcome, albeit limited, peace. 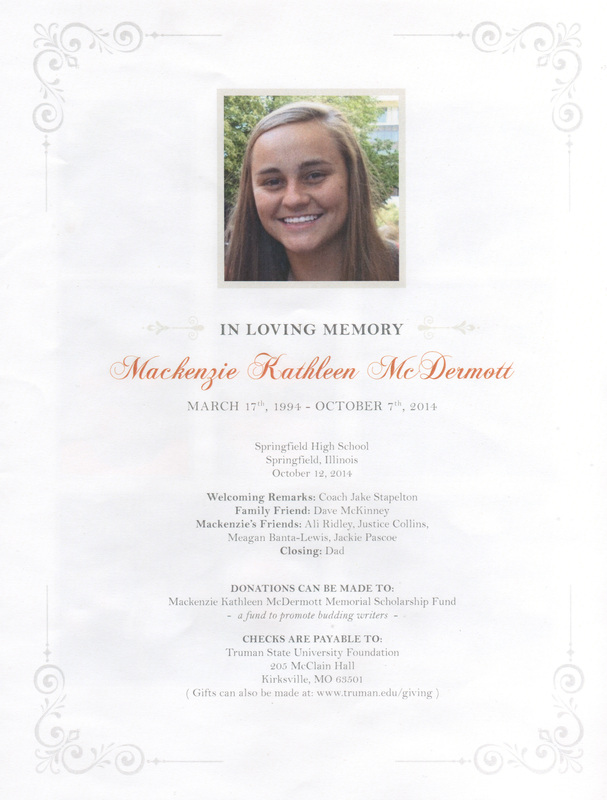 But the endowment of a scholarship in Mack’s honor is the best great deed we have accomplished since Mack’s passing. I take credit for the idea, and Mack’s father did all of the initial work with Truman State to make it happen. 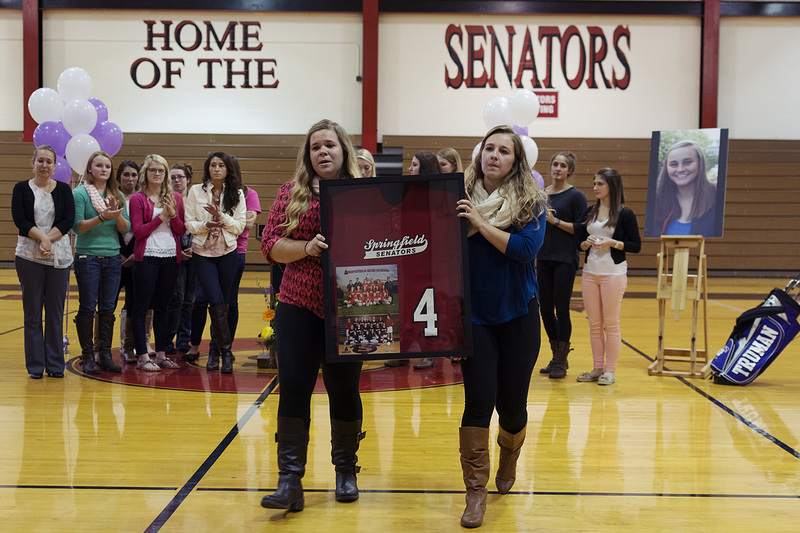 But it took a Mack-sized community of people to make an endowed memorial scholarship a reality. In just two short months, the annual scholarship for creative writers was fully endowed, and in August we honored our first scholarship recipient (https://macksmommabear.com/2014/12/09/honoring-mack/; https://macksmommabear.com/2015/08/15/magical-medicine/). 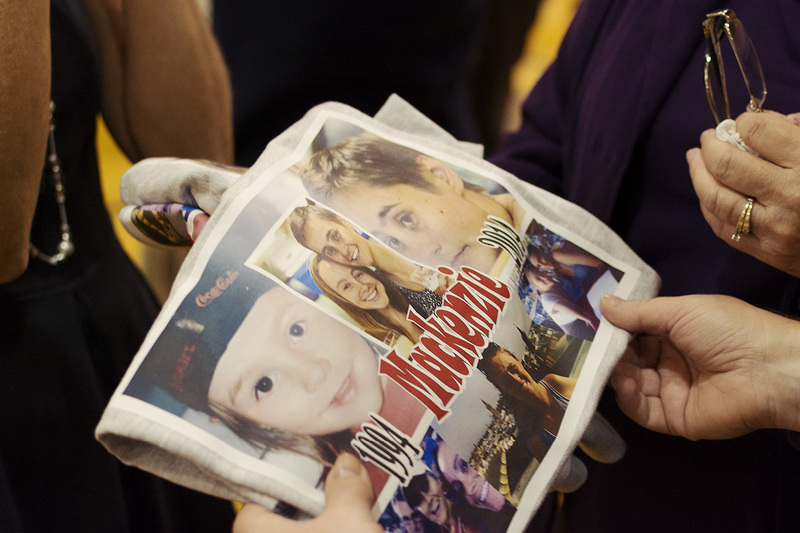 The generosity and love of more than one hundred donors made this great deed possible. I am so grateful for the power of that generosity and love to bring us all some peace. 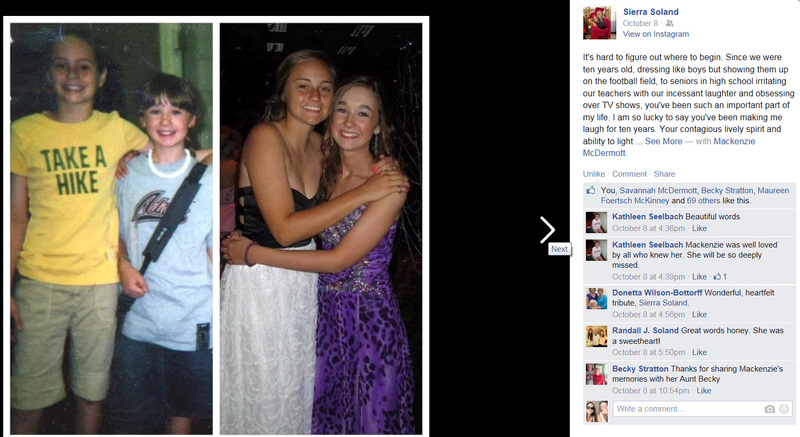 And I stand in awe of the beautiful girl whose life inspired it all. Here we now stand with one year of life without Mack behind us. Every holiday. Every month. Every season. We have survived the lonely and sorrowful road through them all. Now we have some experience—however bitter, however hard—to understand something of the grief we have endured in losing Mack and to recognize the difficulties we yet face in our efforts to adjust to a world without her. And through all of our great deeds and simple gestures, we will continue to appreciate the time we spent with Mack, to cherish the memories we made with her, and to draw strength from the love she gave us and the love we have for her…always.